The Dark Knight Rises and the Biblical Mandate of Isaiah 1:17. While it is not a perfect movie, The Dark Knight Rises is for me the most positive example of the intersection of my faith with art. Certainly, the movie is not without its holes, such as the lack of explanation for how Bruce Wayne (Christian Bale) gets back into Gotham after his exile. While these issues deserve attention, I keep going back to the movie for its thematic message, which reflects my favorite scripture from Isaiah: “Learn to do right; seek justice. Defend the oppressed. Take up the cause of the fatherless; plead the case of the widow” (1:17, NIV). 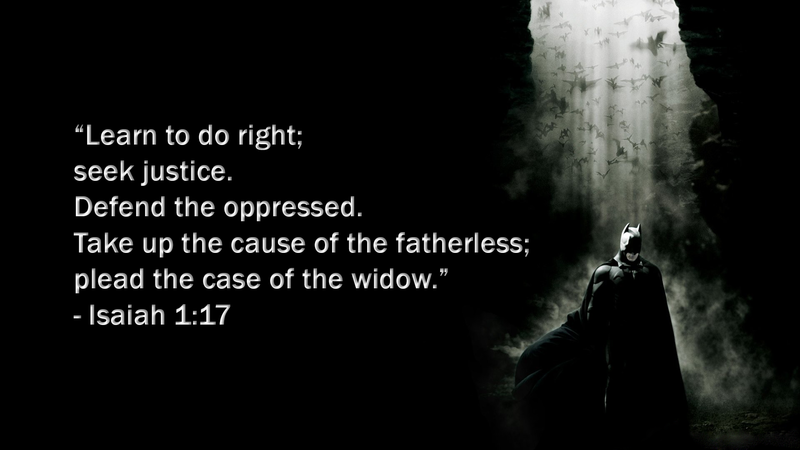 This scripture, especially the part about the fatherless, is the basis of Bruce Wayne’s journey throughout the film. The Dark Knight Rises draws somewhat from the French Revolution—the villain, Bane (Tom Hardy), takes over the city on the pretense of stripping power from the “corrupt” and giving it back to the people. But the backstory that precedes this pivotal revolution concerns the Wayne Foundation and its failure to support orphanages and teen refuge centers. As a result, teens with nowhere else to turn “descend” into Gotham’s sewers to find work. Instead, they find Bane who, in the absence of Batman, becomes their role model and liberator. Without the Wayne legacy, the lost boys of Gotham become the forces of destruction that will perpetuate the same cycle of murder that brought Bruce Wayne to his darkest hour. The catalyst for Batman’s redemption (and Gotham’s) is a young hothead named John Blake, a.k.a., Robin. Just as fans of the character would expect, he goes straight to the Wayne mansion to shake Bruce Wayne from his stupor and to remind him of his calling. Interestingly, their conversation ends with Bruce asking, “Why did you say your ‘boys home’ used to be funded by the Wayne foundation?” (The Dark Knight Rises). The revelation that Wayne Enterprises no longer funds orphanages is the impetus for Batman to return to the streets. Few big-budget Hollywood films possess this kind of thematic undercurrent, and even fewer can be traced to scriptural mandates like Isaiah 1:17 and, similarly, James 1:27. Given the evidence, I do not see it as a theological stretch to trace The Dark Knight Rises to these mandates. Without question, my faith-based perception of a story like The Dark Knight Rises is directly linked to the kinds of stories I hope to tell. The film ends with Bruce Wayne giving his home to Gotham’s orphans and also with the assurance that Robin will be nearby to watch over them. This is a far-cry from the dark, morbid turn some Gotham comics have taken in the past two decades, which insist that Bruce Wayne is as psychotic as the villains he struggles against. While these darker stories have their fans, I am convinced that the vast majority of film-goers want to see redemption on the screen—even for Gotham. My story-telling drive compels me to descend into similar dark worlds of human crisis and to focus not on characters who succumb to the crisis, but who turn the tide in the midst of dark times, dark agendas, and dark principalities. And, just as a side-note, the idea of Batman as the Byronic hero doesn’t hold up in a story where the hero sacrifices himself and gives up everything he has to defend the oppressed and the fatherless. Quite the contrary, this is one of the most prominent and current examples of a biblical hero in mainstream Hollywood cinema. ← The Other Rebellion – Written by Steve B. and Edited by Adam B.